Honoring Our Past. Sustaining Our Present. Ensuring Our Future. Together, we can make all the difference! What does the Bridgton Fund do? The Bridgton Fund is the cornerstone of all fundraising at Bridgton Academy and provides immediate operating support integral to the Academy’s mission and programming. Bridgton Fund dollars are directly utilized to augment all Academy expenses not covered by tuition alone. Donations to this fund support and underwrite programs including financial aid, residential life, curriculum improvements, faculty professional development, athletics, and beyond. In short: contributions to the Bridgton Fund are the fuel that keeps the Bridgton Academy “machine” running! Participation from all alumni, parents, and friends of the Academy is greatly encouraged and celebrated! All gifts to the Bridgton Fund are an investment in the students, faculty, staff, and overall mission of Bridgton Academy, and your donation to the Bridgton Fund is a vote of confidence in BA’s dynamic history and present-day success. In addition, each gift to the Bridgton Fund is an acknowledgment of the enduring impact that the annual achievement of our mission will have on our shared tomorrow. 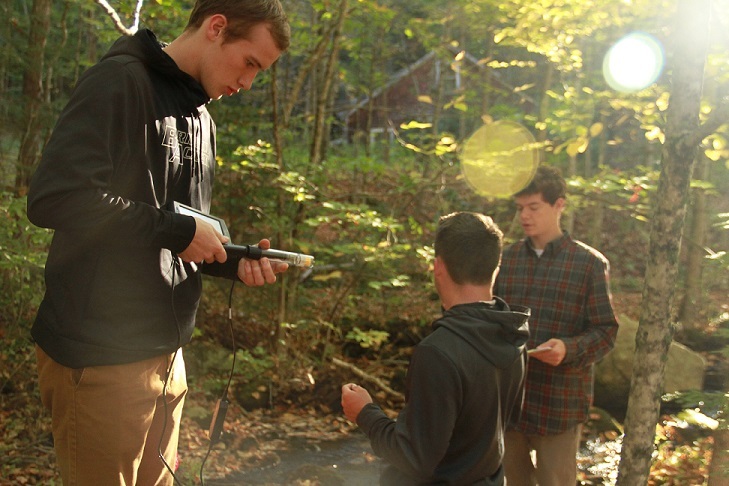 Students in Mr. Miller’s Ecology of the Lakes Region course enjoy a hands-on learning experience. 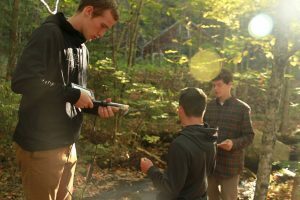 Your Bridgton Fund contributions immediately benefit each young man who has chosen to pursue excellence with his decision to enroll at Bridgton Academy. Each gift bolsters the work of our dedicated faculty and staff and the programs they have put in place to provide today’s BA students with the comprehensive education and individualized guidance that defines Bridgton Academy. While we realize that there are many charities vying for your support, we ensure you that your gift to Bridgton Academy is immediately transformational, and the return on your investment in Bridgton Academy is invaluable—regardless of the amount you choose to donate. Your investment in Bridgton Academy is crucial to our future strength and success. Where does my gift to the Bridgton Fund go? Gifts to the Bridgton Fund fall within two separate categories: Unrestricted Gifts and Restricted Gifts. While all gifts to the Bridgton Fund are highly encouraged – and needed – unrestricted gifts are of critical importance for Bridgton Academy throughout any given fiscal year. These gifts bridge the gap between tuition and the true cost of a Bridgton Academy education. $20.00 – Gas for our BA vans to take students into town to run errands and ski at Shawnee Peak. $50.00 – A day’s supply of breakfast cereal. $100.00 – A student field trip. $150.00 – On-the-road meals for the Wolverine soccer team. $200.00 – Supplies for Bridgton Academy’s art studio, led by BA science teacher and art instructor, Gabe Miller. From student activities, to meals and operating expenses—and everything in-between—you can trust that your unrestricted gift to the Bridgton Fund will be well worth your investment and immediately utilized to positively impact our mission and programs! Our unrestricted fundraising goal for Fiscal Year 2018 (07/01/2017 – 06/30/2018) is $205,000. If you choose to make a Restricted Gift to the Bridgton Fund, your donation is directly applied to the program you have earmarked and will be used to help support the most pressing needs of the program of your choice unless otherwise specified. Supporting Bridgton Academy does not always mean picking up the phone, sending in a check, or making an online gift! Bridgton Academy is proudly partnered with GoodShop and Amazonsmile—with a percentage of each of your purchases going directly to Bridgton Academy! There are no added costs or fees involved. Supporting BA has never been easier! All donors (unless otherwise requested) will be recognized in our Annual Report on Giving, published each fall.